One campaign — or your entire DM program. Bring us your requirements and we'll take it from there. DCM offers an array of advanced direct marketing solutions we've developed over more than 30 years. 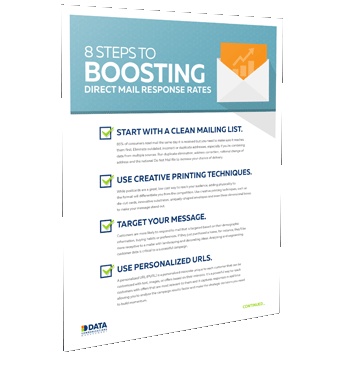 As many of our clients know, direct mail remains the most effective medium for engaging people. Our DM capabilities range from highly personalized 1:1 full-colour digital to long-run addressed and unaddressed admail. We also provide extensive commercial-print production of base stock for variable printing. Through national lettershop resources, we can insert hundreds of thousands of pieces a day across Canada, using capabilities like matched-mail inserting, ink jet, polybagging, and dimensional mail. We distribute mail through Canada Post, USPS and Royal Mail. Providing full creative consultation, we offer specialized expertise in areas like gift cards and labels, along with one of Canada's largest selections of eco-friendly and FSC® options, including envelopes. Our email marketing is available as a standalone service and as part of an omni-channel strategy that might include variable direct mail, triggered email, personalized landing pages and dashboard reporting. Personalized, variable messaging is a powerful way to reach out to customers, donors, employees and members. We help you integrate variability into your direct-marketing strategies to create communications that are relevant, timely and affordable. Our seasoned project managers, many with 15+ years of experience, are skilled at managing large, national data-driven programs. Applying rigorous processes for cleansing, validation and augmentation, we ensure optimal hygiene and list management, helping you maximize response and ROI.